Resources » LoopUp now open for business in Madrid, Chicago, Dallas and Los Angeles! We are delighted to announce the opening of four new LoopUp offices in Madrid, Chicago, Dallas and Los Angeles. 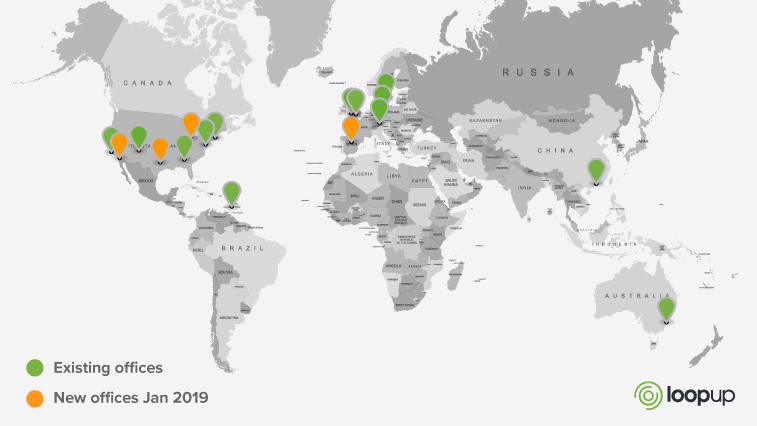 With existing offices in London, San Francisco, New York, Boston, Atlanta, Denver, Cardiff, Berlin, Munich, Malmo, Sydney, Hong Kong and Barbados, LoopUp now has 17 offices around the world, with more planned for 2019. LoopUp started in 2002 with offices in London and San Francisco. Today, more than 2,000 businesses trust LoopUp with their conference calling requirements, including many multinationals with employees around the globe. Our largest markets are still the US, where 45% of our accounts are based, and the UK where 35% are based. But 20% of our customers are based in other markets, with rapid growth in Spain, Germany, Australia, Canada, the Netherlands, Ireland and France. Over the next few years, we plan to open more offices across Europe, the Americas and Asia-Pacific. We already sell to clients in 25 different countries, and users can join a LoopUp conference call from any country in the world. But we aim to offer local account management and user support wherever possible. This helps us to really understand our customers’ needs and to tailor solutions to meet them. It also allows us to deliver exceptional levels of support and training. And to improve the meeting experience for our global user base, we are adding a range of languages to the LoopUp user experience, which has previously only been available in English. The initial set of languages includes Spanish, French, German and Swedish, with more to be added later in 2019. To support such rapid international growth, LoopUp has been investing heavily in recruiting and training a new generation of sales, account management and customer support staff. All new hires go through LoopUp’s innovative ‘Pod Academy’ global training programme, and each new office contains a mix of new Pod Academy recruits and experienced LoopUp team members. Over the next few weeks, we’ll provide more detail about each new LoopUp office and our local teams.